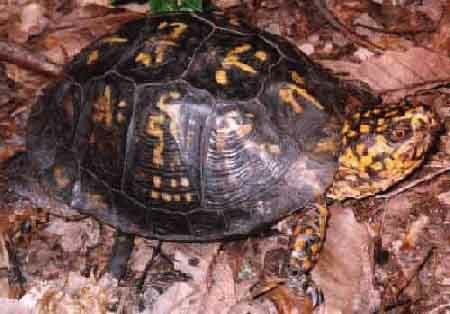 The Eastern box turtle is a medium sized turtle that lives in the Laurel Lake area. The Eastern box turtle has a dome-shaped shell suitable for this species to totally withdrawits legs, head, and tail into the shell. 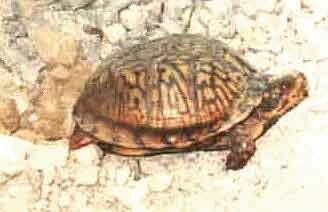 Eastern box turtles grow to a length exceeding 6 inches in the carapace. Its carpace color is brown and yellow with growth rings on the scales . Males have concave plastrons, reddish eyes, andthe vents that open nearer to the tips of the tail than those in females. Box turtles are more terrestrial than other species of turtles. In autumn, box turtles move to lower valleys where they bury themselves in the mud of a stream bed. They hibernateon land, selecting a shallow depression on hillsides where leaves and loose soil will offer protection. Box turtles are not aggressive and rarely bite. Box turtles make delightful pets. Box turtles are omnivorous . Their diets include fruits such as strawberries, blueberries, grapes, tomatoes, and mushrooms.They also eat worms, insects, and small vertebrates. Box turtles mate shortly before hibernation. During courtship, the male bites the female on the head, neck, and shell. The female lays eggs in loose, sandy soil. Box turtlesexcavate flask-shaped nests. Females lay between 2 and 7 eggs.Incubation periods are extremely variable and usually range between 70 and 95 days. The baby box turtles usually remain intheir nests throughout winter.